PARIS — The euro zone economy grew slightly faster than expected in the last three months of 2013, an official report showed on Friday, bringing welcome news for the global economy amid signs of slowing in the United States and China. Although growth in the 18-nation currency union is still weak, at a 1.1 percent annualized rate, it was the euro zone’s third straight quarter in positive territory, indicating that the bloc is well beyond the year-and-a-half recession that ended in mid-2013. The broader 28-member European Union also grew, though weakly, for the third consecutive quarter. The Union, with a market of 500 million consumers and an economy worth about 11.7 trillion euros, or $16 trillion, is one of the pillars of the global economy, and the extended weakness there has been a major source of concern for officials in the United States. Germany and France, the two largest euro zone members, led the upturn. The Netherlands broke out of recession, and the pace of growth picked up modestly in Portugal, Spain and Italy. The 0.1 percent quarterly growth in Italy, where Prime Minister Enrico Letta resigned on Friday to clear the way for his Democratic Party rival Matteo Renzi, was the first expansion in the country’s beleaguered economy — the third-largest in the euro zone — since the first half of 2011. “The most important point is that the recession really is over, and the periphery is growing again,” Jörg Krämer, chief economist at Commerzbank in Frankfurt, said. And yet, he quickly added, the pace is inadequate to have a meaningful impact on Europe’s biggest problem, the 26 million people without jobs. The euro zone economy grew 0.3 percent in the fourth quarter from the previous quarter, when it expanded 0.1 percent, according to Eurostat, the Luxembourg-based statistical agency of the European Union. The quarterly rise was better than the 0.2 percent growth economists had been expecting. The 1.1 percent annualized rate continued to lag that of the United States, where growth perked up to 3.2 percent annual pace in the fourth quarter. But the Eurostat report nonetheless came as a welcome surprise as more recent data from the United States, including a disappointing report on industrial production on Friday and a weak retail sales report on Thursday, were suggesting that a slowdown might be in the offing. China’s economy, the second-largest in the world after the United States’, appears increasingly fragile in the face of a push by the authorities in Beijing to deflate what is widely regarded as a giant credit bubble. The euro zone figures released on Friday might also have brought at least a small measure of relief to Mario Draghi, the president of the European Central Bank. He and his colleagues on the bank’s Governing Council have been watching the economic data for signs that ultralow inflation in the euro zone might be a sign of underlying weakness that could tip the bloc into outright deflation, a downward spiral of falling prices and economic torpor that can be hard to reverse. Mr. Draghi said in the last week that he wanted to see additional data, including the euro zone gross domestic product report, before making any further adjustments to monetary policy. His critics have been urging the central bank to take steps to stimulate the economy, but Mr. Draghi’s options are limited, particularly with the bank’s benchmark interest rate down to a record of 0.25 percent. Mr. Krämer said the data on Friday was in line with the E.C.B.’s own forecasts and would merely confirm the central bank’s expectation for a slow, steady recovery. It will want to see additional data before deciding whether to move on monetary policy, he said, with reports on inflation, money supply and bank lending, as well as a survey of purchasing managers, before the March 6 meeting of the Governing Council. The bank’s own economists will also be making new forecasts next month, including the inflation outlook for 2016. 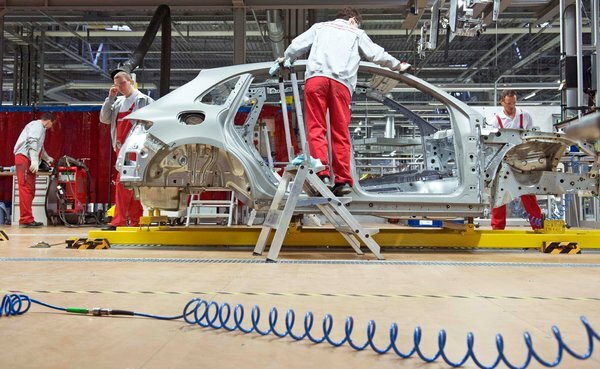 The acceleration in growth is reflected in the automobile industry, one of the sectors hit hardest by the slowdown in the euro zone. Ford Motor said on Friday that sales in its 20 most important European countries rose 9.2 percent in January compared with a year earlier. It was the eighth consecutive month of improving sales, Ford said, and followed several months of upturn in the overall car market. ArcelorMittal, the world’s largest steel maker, said in the last week that it expected demand in Europe to increase as much as 2.5 percent this year, a welcome change from the steep slump the industry has endured since 2008. Financial markets met the news calmly, with the broad Stoxx Europe 600 index adding 0.6 percent on Friday and the euro ticking up 0.1 percent against the dollar to $1.3698. As welcome as the growth report might be, Europe’s recovery remains fragile. Germany’s gross domestic product grew 0.4 percent from the previous quarter, the Federal Statistics Office reported from Wiesbaden, citing stronger foreign trade as an impetus. That was better than the 0.3 percent growth recorded for the July-September period, and better than the 0.3 percent analysts were expecting. It works out to a roughly 1.6 percent annual rate. 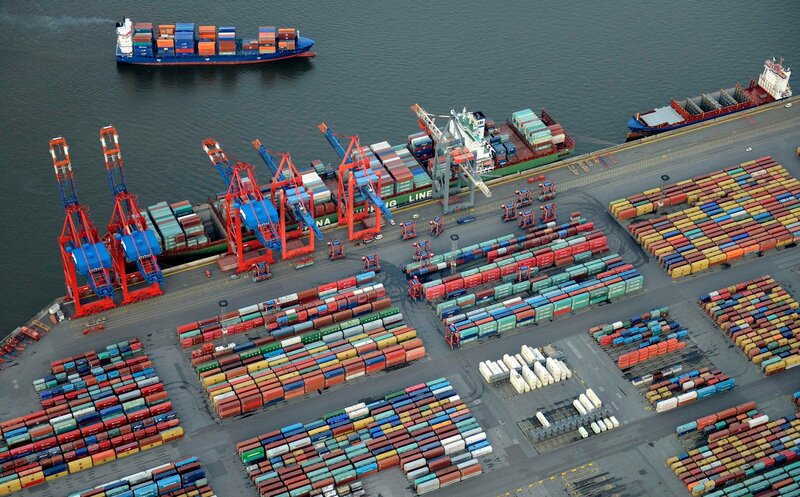 German growth was the result of higher exports, the country’s Federal Statistical Office said on Friday. In addition, German companies stepped up investment in construction projects as well as equipment. But German household spending dipped slightly in the fourth quarter compared with the third period, according to seasonally adjusted figures. The decline may come as a disappointment to those who hoped that Germans would help stimulate the euro zone economy by buying more products from their neighbors or taking more lavish vacations. Mohsen Sohi, chief executive of the Freudenberg Group, a German manufacturer, said that 2013 was “an exceptionally challenging market environment” but that there were signs of improvement in the second half. France’s gross domestic product expanded 0.3 percent in the October-December period compared with the previous three months, Insee, the national statistical agency, reported. It cited a year-end burst of household spending and business investment for the spurt that finally pushed the French economy back above the precrisis level of early 2008. Even with the modestly good news, Europe continues to operate far below its capacity, with an output gap — the gulf between actual and potential output — of as much as 3.8 percent, according to the Organization for Economic Cooperation and Development. That means weak demand has left the economy with plenty of slack. Nicola Clark contributed reporting from Paris, and Jack Ewing and Stanley Reed from London.